. 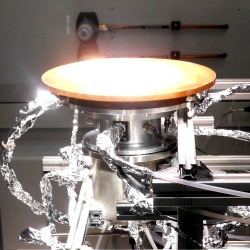 : Optics & Photonics Focus :: Solar Fuel: No More Drilling! :. Superfluidity is usually studied at ultra-low temperatures using very delicate setups. However, light can also mimic superfluid behavior, a fact which could make experiments considerably more accessible. The reaction chamber where sunlight becomes chemical energy. This picture shows the reaction chamber of the new solar collector illuminated by light coming from a solar simulator. A quartz window at the top allows both infrared and ultraviolet radiation to enter the chamber where the cerium oxide is deposited. Ra, Helios, Apollo… Since ancient times, mankind has deified the Sun, worshipped its power and feared the strength of this vast, yet intermittent source of energy which we are still unable to manage effectively, despite the scientific knowledge we possess. A new solar collector, the result of a collaboration between the California Institute of Technology (Caltech, California, USA), the Swiss Federal Institute of Technology Zurich (ETH Zürich, Switzerland) and the Paul Scherrer Institute (Villigen, Switzerland), uses solar radiation, water and carbon dioxide to produce the basic ingredients for liquid hydrocarbon fuels, thus offering a solution to recovering atmospheric carbon dioxide and to storing solar energy in a technically reusable form. Learning how to efficiently harness solar energy is one of the biggest challenges for the future where environmentally friendly technologies are concerned. Most living organisms already rely on the Sun, either directly or indirectly. Through photosynthesis, plants, algae, and cyanobacteria exploit the energy of sunlight to convert water and atmospheric carbon dioxide into the molecules they need to live. Cold-blooded reptiles exploit infrared solar radiation to keep warm and speed up their metabolism. Warm-blooded animals also indirectly obtain energy from the Sun in the meat and vegetables they eat. Among the several human attempts to store solar energy, photovoltaic panels and solar collectors are two of the most popular and they are used as components in larger photovoltaic systems to supply electricity for commercial or residential applications. Nonetheless, photosynthesis, a process in which plants chemically transform simple molecules into others with richer energy content, remains, still today, probably the most effective way of storing solar energy known to mankind. The new solar collector, designed by Sossina M. Haile from Caltech, Aldo Steinfeld from ETH and their research teams, also transforms some molecules, such as water and carbon dioxide, into other molecules, such as oxygen, carbon monoxide and hydrogen, the precursors of liquid hydrocarbon fuels. Carbon monoxide and hydrogen can subsequently be properly stored and used to produce gasoline or diesel with the Fischer-Tropsch process. However, there are two main differences between the chemical reaction in the collector and the photosynthesis of plants. First, photosynthesis is a construction process during which simple molecules are transformed into more complex molecules, while the collector implements photocatalysis — a molecular disassembly process—, thereby splitting molecules into simpler ones. Then, plants, or rather chlorophyll molecules, exploit the ultraviolet and visible radiation spectra, while the collector, which is powered by heat rather than light, focuses solar radiation onto a reaction chamber to obtain high temperatures — higher than 1500 degrees Celsius. Why such high temperatures? At these temperatures, some metal oxides, such as ceria, become very reactive by releasing oxygen atoms. In this state, the oxide can easily accept oxygen back from other molecules. To exploit this phenomenon in the experiment, the inside of the reaction chamber was layered with ceria in order to accelerate the transformation of carbon dioxide and water into carbon monoxide and hydrogen, respectively. "The point of this work was to make a fuel using sunlight, water and carbon dioxide. The process is quite different from the more typical photoelectrochemical approaches to achieve this same goal," says Haile, and she adds: "Our success is because we recognized that cerium dioxide works very well for the thermochemical process, and because we collaborated with a world expert, Aldo Steinfeld at ETH, on solar reactor design. I do not believe that the few labs working on thermochemical approaches have tried every candidate material, and I am hopeful that even better choices than ceria may emerge." The recovery of carbon dioxide emitted into the atmosphere would be yet another interesting application for this device. Andrew Bocarsly at Princeton University (New Jersey, USA) points out that "in the dialog on remediation related to climate change, proposals of carbon mitigation, which involve trapping and storing carbon dioxide underground, imply large costs for the process and no return. The schemes that convert carbon dioxide into a product that is useful (and thus that can be sold) will mitigate the cost of carbon dioxide trapping, and in the case of a fuel forming reaction (of the type discussed here) they will also mitigate the total energy cost of the process." Although we are still far from directly capturing atmospheric carbon dioxide, Haile explains that there are other ways of reducing it. "The first is to use the carbon dioxide from an electricity power plant running on fossil fuels to generate transportation fuels. When used in transportation, the carbon dioxide emerges from the tailpipe of vehicles and is almost impossible to re-collect. Thus, the process effectively uses the carbon twice before releasing it into the atmosphere. The second way to run the process is to start with a batch of carbon dioxide (and water), convert that into a stored fuel that is used locally to generate electricity when the sun is not shining, then use the carbon dioxide (and water) from the second step to run the solar-to-fuel step again. In this way, you have a cycle that does not consume or release any carbon dioxide (or water) but simply delivers electricity from the sun on demand. A final possibility is to make only hydrogen and then use this hydrogen for fuel cell vehicles, but the problems of hydrogen storage and delivery still need to be solved." Compared to other thermochemical processes for fuel production, this solar collector shows higher efficiency, and a first analysis indicates that this efficiency could be increased even further, so much as to make it competitive with the production of gasoline from the extracted oil. "There are some interesting engineering challenges in making this solar thermal cycle run efficiently," says Thomas E. Mallouk at Pennsylvania State University (Pennsylvania, USA), "but I do not know of any fundamental reason why the efficiency could not be as high as that of more expensive photovoltaic cells. Cerium is a relatively abundant element — it has about the same terrestrial abundance as cobalt or copper, so supply should not be an issue. The cost of carbon dioxide depends on the source. Ethanol plants and ammonia plants produce it for under $25 per ton, whereas the cost of carbon dioxide captured from power plants or from the atmosphere could be as high as $100 per ton. In those cases, this technology will require further development before it can be used in solar fuel production. This is a significant cost but it is still small compared to the price of the final fuel product." LC is currently working on his doctoral thesis at IST - Instituto Superior Técnico, Technical University of Lisbon, Lisbon (Portugal). William C. Chueh, Christoph Falter, Mandy Abbott, Danien Scipio, Philipp Furler, Sossina M. Haile & Aldo Steinfeld, High-Flux Solar-Driven Thermochemical Dissociation of CO2 and H2O Using Nonstoichiometric Ceria, Science (2010) 330, 1719-1801 (link).